Bringing up Charlie: I've flipped! I hope I flippin' well don't have to keep you waiting long, Rebecca. 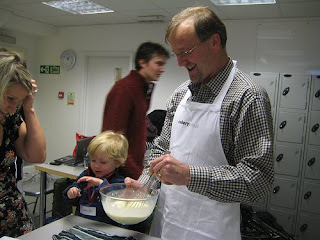 And that apron - cleanest I've worn all decade! 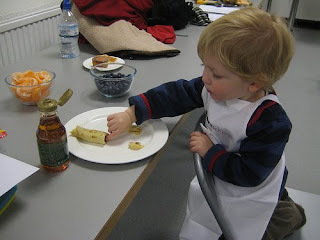 A day of pancake fun at the Cookery School in Little Portland Street, Heather...basically being taught the secetsof the perfect pancake. Oh, and eating them! Thanks CM... I didn't feel it! Appearances can be se deceptive. Oh Emma Forbes, she is a blast from my yooth. Oh and panckes, how I love you pancakes. The boys love watching me flip em!! I think Charlie missed the moment, MH. As, of course, did Sally. And I've never done it before (pancakes have always been Sarah's thing). Which is why I have to get that footage! I can indeed report that I did see Tim flip live and I was so impressed I cheered at my computer screen. It would have been funny if he has dropped it though, I have to admit. Tim, are you inviting us all round for a pancake day celebration? Sounds like you had a great time. 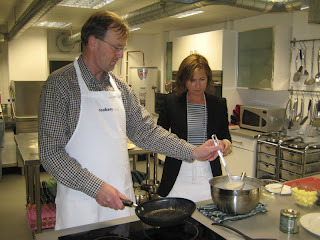 For christmas I bought my husband a day's cookery course. I'm looking forward to him bringing home his efforts. I think he gets an apron to keep too! Perhaps you and Sally could do a Fanny & Johnny Craddock? Ooh, ooh I saw some of it! Through a link on Twitter! You're famous! Well done you, it's a life skill learned. Wow, that sounds like one cool Christmas present Trish! You'll have to keep us posted (literally) about his efforts. Well, maybe Nigel and Nigella Lawson CW... although on second thoughts, I don't fancy being Chancellor of the Exchequer. Maths was never my best subject. Well, hold on to those images Tina, because I've just been told the video has been deleted. Wonder if I can re-create the whole thing in our kitchen? Yay you're a tv star!!!! Looking forward to seeing the video. Well, a star of Justin TV briefly DJ! And - bad news - I was told yesterday that there wasn't a copy of the film... What a disappointment! I saw you all on the webcam (not that I'm some kind of stalker or anything!) Looked like good fun and I'm impressed you ventured into London in the snow. Well, I'm glad someone else saw it MDM. Especially as the footage is missing, presumed deleted. I'll just have to do the re-make: Pancake 2 - The Final Flip!